Night launches are amazing and I am a little sad that this may be the final night launch of the shuttle program. It is truly awe inspiring how the sky illuminates despite the 60 miles distance. My husband was nice enough to come with me to the lake at the end of the street where I set up my 'ghetto tripod.' We used a mini tripod from the dollar store sitting on-top of a stool. (My husband was thrilled about carrying the stool.) I have a list of photography accessories that I would like to have...but I figure that I will appreciate them more if I wait to get them, or receive them a gifts. My husband on the other hand, loves accessories and thinks that if an accessory exists for a hobby we should own it. Believe it or not, I don't think that we have ever had an argument about money or spending. I don't mind that he buys all the accessories, and I think that he laughs at my make shift accessories. (Last week I taped a piece of paper to my camera to diffuse the light.) To be honest I think it is fun to use what I have and be resourceful. Thanks honey for accompanying me to the launch and carrying the stool. Amazing photos. I just commented on your ATWT spider photo, and then realized your are near Orlando. My daughter and I lived in Waterford Lakes, and just recently returned home to PA. 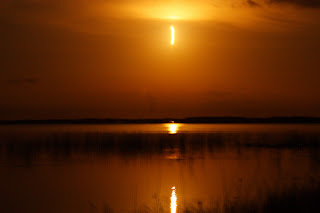 I was so thankful for the shuttle launches we were able to experience, and each time it launches now, I have to say I am a little sad. Thank you so much for sharing your amazing point of view! Good luck with the photography.